While Jesus went out of his way to welcome children, churches aren’t always so good at it. Sure, we’ve got nurseries, kids’ church, and child check-in, but as a parent trying to introduce your kids to church, sometimes it feels like churches want kids anywhere but the worship service. 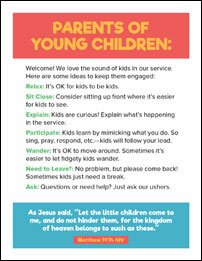 For the churches that do welcome kids to the worship service, we have a handy, ready-to-print pew card that can help put parents at ease. It sets the tone that kids are truly welcome. It gives parents some tips for how to help their kids engage with the service. It offers parents a few options for what to do with their kids. These free welcoming kids pew cards come in several formats for easy printing. Or they could serve as inspiration to create your own. We’ve got tips for what a kids card should include, and if you’re doing a custom card you should definitely include some specifics about what options your church has for kids. Our Courageous Storytellers membership site has more resources to help you create the right environment in your church. Check out the resources and consider joining to get full access. Church “Mascots” for Children’s Ministry?